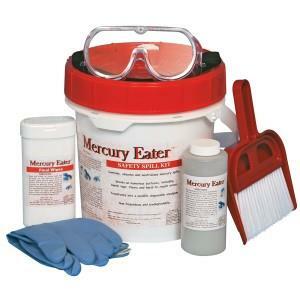 Be prepared for safer mercury cleanup and vapor suppression with this specialized spill kit. Limit worker exposure by suppressing hzardous mercury vapors. 1. The absorbent powder contained in this Mercury Spill Kit will bond with droplets of mercury, transforming them into a solid material and making it safer to handle and dispose of. 2. Remove jewelry, eyewear and all other metal objects. Put on appropriate personal protective equipment (supplied in this spill kit) prior to entering the spill area. 3. Sprinkle Mercury Absorbent Powder in a circle around the spill to prevent the mercury from spreading. 4. Gently pour the absorbent powder onto the spill, working from the outside inward until the mercury is completely covered. 5. The mercury will be completely absorbed in 2 to 3 minutes, making it a solid material and eliminating dangerous vapors. 6. Remove the solid material by sweeping it up with the broom and dust pan found in this kit. Place the collected material into the provided disposal bag. When finished with the broom and dustpan, place them into the disposal bag as well. 7. Use the Mercury Cleanup Wipers to wipe the surface and remove any residue. 8. Place all used wipers in the disposal bag and tie the bag closed. Place the bag in the Spill Kit container and close the lid. Caution: Heat may be generated during absorption process. Note: Appropriate personal protective equipment (PPE) should be worn when treating any hazardous spills. Storage Notice: Store product in a cool, dry and well-ventilated area, away from moisture. Disposal Notice: Dispose of all used materials in compliance with local, state and federal regulations. Used absorbents can be considered hazardous and must be disposed of in compliance with local, state and federal regulations.